Creating WBS with free templates and examples. WBS has never been easier. A work breakdown structure (WBS) is a chart in which tasks are illustrated to portray their relationships to each other and to the project as a whole. WBS helps you analyze and divide your project into work packages and dependencies by providing a common framework for the natural development of the overall planning and control of a project. It is a very useful kind of management infographic. The graphical nature of the WBS can help a project manager predict outcomes based on various scenarios, which can ensure that optimum decisions are made. 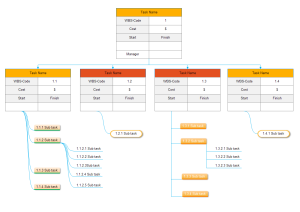 A work breakdown structure element may be a product, data, service, or any combination thereof. 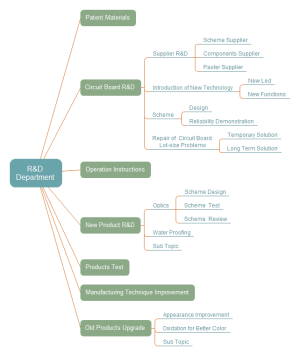 Edraw Max provides an approach to visually and graphically create, edit and modify work breakdown structure diagram. In the Project Management category, double click the work breakdown structure template, then drag and drop the shapes you need. With the help of Edraw smart tools, you can customize and design your drawing with free templates. A Work Breakdown Structure could be done in just minutes. Then you output the diagram to different formats like PDF and other graphic formats, or print without any quality loss. Edraw WBS templates offer you lots of special shapes used in the WBS diagrams, main task, sub task, major connector, curve connector, arc connector and line connector. All these WBS shapes will be good assistants for you when drawing the WBS diagrams. This is a work break down structure of software development. It is perfectly laid out and fully editable. Connectors stay glued to shapes even after you move shapes. 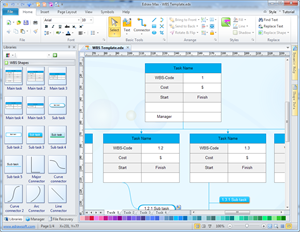 A WBS template is presented to help users quickly design a quality WBS diagram.